Order online this gift of Exotic Gift of 1/2 Kg. 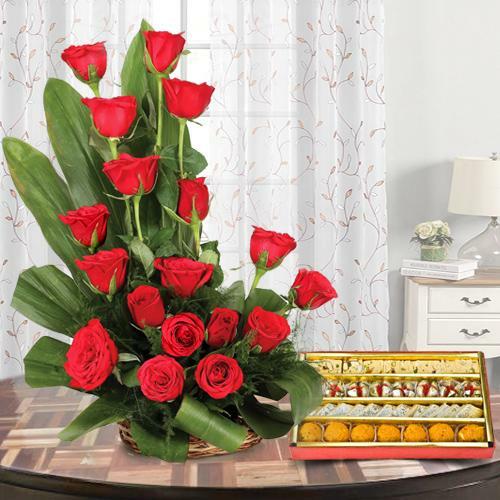 Assorted Sweets and 18 Red Roses Bouquet for your special one and show your love and affection. Flowers Delivery Secundrabad, Send sweets Kota, Wedding Cake Mehsana, Diwali Mithai Gaziabad, Send Flowers and Gifts to Kochi, Online Shop Alwar, Flower to Thiruvanthapuram, New Year Flowers Agartala , Fresh Fruits Puri, Send Gift Pune, Dry Fruits to Ernakulam, Birthday Delivery Zirakpur, Sending to Vijayawada, Flower shop Jalna, Thirualla Online Cake Delivery.